Dungannon clinched their first Premiership win since August thanks to victory over in-form Coleraine. Ryan Harpur's free-kick squirmed through the legs of keeper Michael Doherty before Andrew Mitchell headed in to put the Swifts 2-0 ahead. 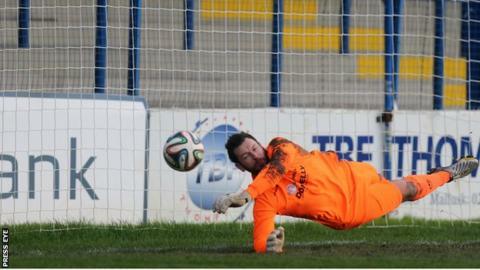 Neil McCaffrety wasted the chance to level when his penalty was saved by Andy Coleman before the break. Gary Browne pulled one back after 85 minutes but Dungannon held on for just their second league win of the season. Doherty was at fault for the opener on 10 minutes as he failed to keep out Harpur's long-range strike. Bannsiders midfielder Michael Hegarty headed against the bar before Mitchell doubled Dungannon's advantage in the 40th minute. Harpur headed onto the bar and Mitchell was quickest to react as he dived to head in the rebound. Mark Miskimmin was fouled by Fra Brennan for the penalty which McCafferty, who hit a post with an early free-kick, saw saved by Coleman seconds before the break. Jamie Glackin should have added a third but he scuffed his shot while Ian Parkhill blasted over for the hosts. Parkhill set up Browne to net and give Coleraine hope but Dungannon held firm for a win which takes them three points clear of basement side Warrenpoint Town.